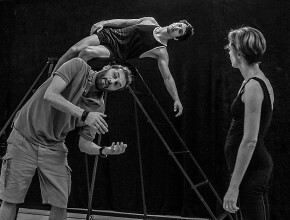 Given the success of the workshop, premiere of the new pieces by the participating choreographers in 2014 and in view of his relationship with the JERUSALEM BALLET, Giorgio Madia, came back to direct his second choreographic workshop 2015. Nadya Timofeeva, Oded Ronin and Assaf Bencherit. Featured dancers included artists oft he Jerusalem Ballet and guest artists.